Waterfront Rustic Luxury Home on Lake Norman! Your very own Private Gated Entry to Almost 5 acres on Lake Norman! Almost like living on your own Island! Very Private! Flagship Home for Most respected Custom Log Home Builder ~Old Hickory Log Homes. This home has everything and every detail, Resort Style In Ground Pool w Jacuzzi, Theater room, Billiards room, 2 Full Kitchens, 2 Wet bars, In Law Suite downstairs, Outdoor Fireplace with Grill Area, 7 garage bays, expansive Main Channel views of Lake Norman from almost every room! Oversize Covered Boat Slip w/lift to accommodate larger boat + Jet ski ramps. Located in Denver which is 30 minutes north west of Uptown Charlotte. 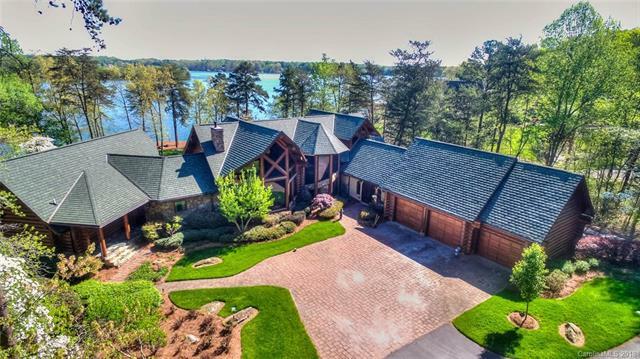 This home is Most Definitely one of a kind on Lake Norman! From Charlotte take I-277 North to NC-16 North. Right on St. James Church Rd, Right on Campground Rd, Left on Catawba Burris Rd, Right on Bankhead Rd, Left on Woodchuck, Gates on your Right.